The Acrolite 1M was designed as a good performing entry level aircraft in a light, low cost package for those pilots that want a stable easy to fly, recreational light aircraft. It is designed with strength, ability to take abuse, ease of repair, good short field performance and stable flight characteristics as the most important features. 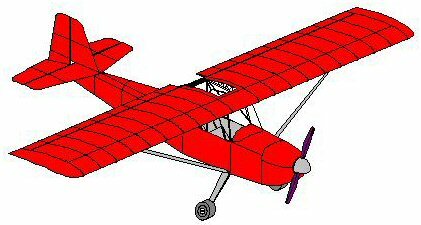 The high wing monoplane design affords good visibility and requires a pilot with only average flying ability but with some experience in taildraggers. The aircraft is stressed for the ultralight category at limit load of 4 G positive and 2 G negative with a 1.5 safety factor at a gross weight of 650 lbs. The aircraft can use any of the popular ultralight engines from the Rotax 40 hp 440 to the 65 hp 582 or any engine of similar weight and power. The fuselage is constructed of welded 4130 chrome moly steel tube. A welded steel fuselage is generally considered to be the most durable, is easy to repair and provides the best protection against impact damage. Control linkages to the ailerons and elevator are push-pull rods with bearings on each end. The tail assembly is constructed of 6061 aluminum tube riveted together with 2024-T3 aluminum gusset plates. The wing is of 2024-T3 aluminum stressed skin construction with a box section main spar, a channel section rear spar, fully sheeted and flush riveted with 1/8 inch diameter stainless steel blind rivets. The airfoil is GA30-412 semi-symmetrical section designed by Harry Ribblett. This airfoil is noted for its high lift, low drag and excellent stall characteristics. The ailerons are semi-full span aluminum tube, static balanced. The fuselage, empennage and ailerons are fabric covered with 1.7 oz PolyFiber fabric. The plans for the prototype have been drawn and a computer projected performance and stress analysis has been completed. Construction was started on the prototype but has not been completed.